Budget season approaches – and soon it will be time to turn your attention from the law to the ledger. According to Audit Analytics, more than 70 percent of companies have a December 31 year-end; for this majority, the next few months are a critical time to request and allocate resources for the year ahead. It doesn’t have to be painful. We promise. Over the next few weeks, we’ll look at the financial side of corporate legal operations – from alternative fee arrangements to special considerations for smaller departments. We’ll share some of the budget-oriented results from the Legal Operations Health Check, and we’ll look at simple ways to use data to build a better budget. First, though, it helps to know where you stand. Here are some benchmarks to help you gauge how your department’s budget compares with others. 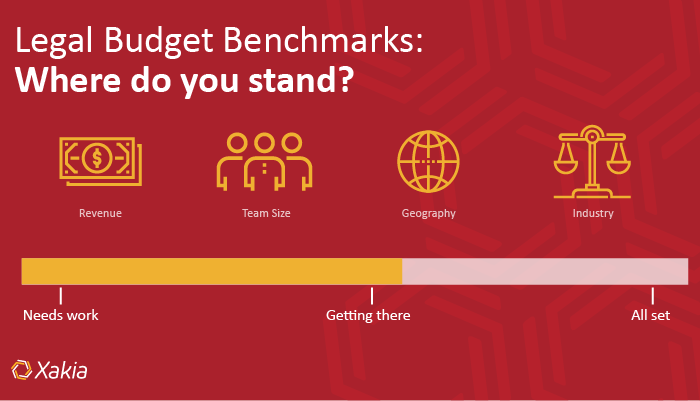 While every team and company is different, benchmarks can help establish context – or give you fodder to ask for a budget increase. According to The GC350, a benchmarking study commissioned by the Law Society of England and Wales, the average proportion of legal spend to revenue is 0.6 percent (or .006). On a more global front, Major, Lindsey & Africa’s Benchmark Survey polled 241 companies throughout North America, Europe, Asia and Australia. For legal spend as a percent of revenue, it reports a median of 0.27 percent and an average of 1.5 percent. Given this wide range – assuming organisation revenue of US$500 million, a legal budget could land anywhere from US$1.35 million to US$7.5 million – we recommend using a combination of additional metrics to determine your appropriate target. For total legal spend per lawyer, the median is US$394,000, and the average is US$630,000. For total legal spend per legal staff, the median is US$262,000, and the average is US$381,000. 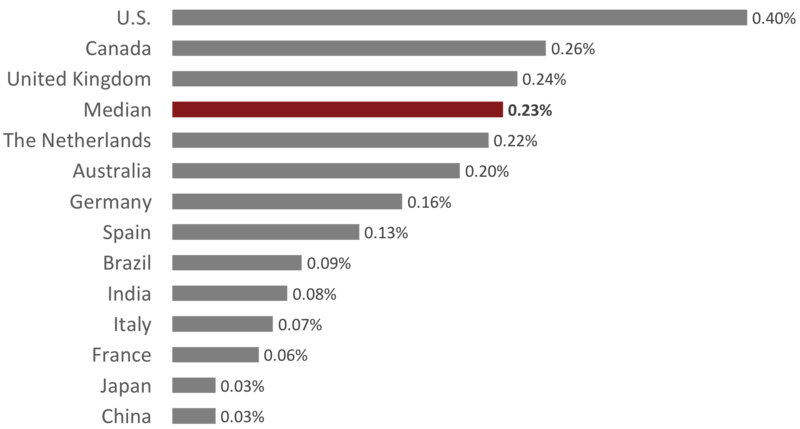 Acritas data suggests that companies based in the United States may be skewing averages for everyone else. Indeed, the global median for legal spend is 0.23 percent of revenue – but for U.S. organisations, it’s 0.4 percent. The other countries above the global median are Canada (0.26 percent) and the United Kingdom (0.24 percent). Referring once more to Acritas’ Patterns in Legal Spend: The global median is 0.23 percent of revenue, but this varies widely by industry, generally aligned with regulatory burdens and the volume of litigation and transactions. 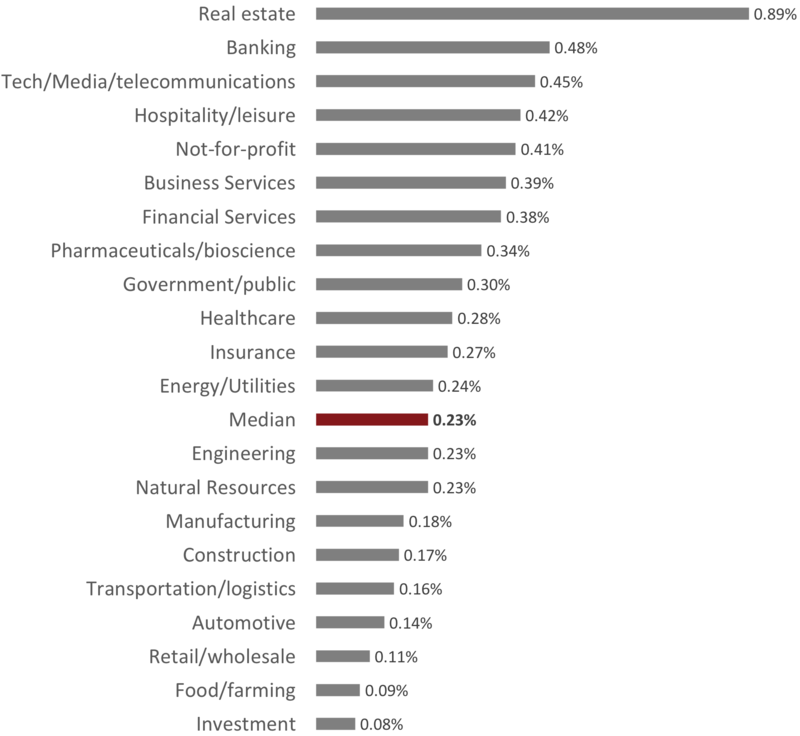 Real estate comes in with the highest percentage of revenue - 0.89 percent – while food/farming (0.09 percent) and investment (0.08 percent) have the lowest. In the latest Altman Weil Chief Legal Officer Survey, 44.5 percent of respondents said their budgets would increase; of these, more than half predicted a 1 to 5 percent increase. Fewer than 10 percent of respondents overall expected an increase of more than 10 percent. Meanwhile, 36.4 percent of respondents said their budgets would decrease, with 29.8 percent expecting cuts of 1 to 10 percent. Fortunately, only 6.6 percent expected drastic cuts of more than 10 percent. For 19 percent of law department leaders, the budget was expected to remain flat. We know you probably didn’t choose a profession in the law because you love debits and credits; you may see the budget process as a tedious chore (or worse). But keep in mind it matters to the C-suite: In Altman Weil’s CLO survey, 28.9 percent of respondents said the CEO or board of directors viewed “controlling legal spend” among the law department’s top three priorities. Legal departments that hit their budgets are more likely to have a seat at the table: In its Law Department Management Report, the ACC reports teams that make budget are statistically more likely to have regular meetings with business leaders on operational issues. Legal departments that hit budgets may be less vulnerable to regulatory investigations: The ACC also found “a strong correlation” between departments that keep spending within budget and departments with fewer regulatory issues. If you’ve been using the “last year plus 5 percent” method of budgeting, it’s time for a fresh approach. Ready to get started?